Antibody-mediated rejection (ABMR) can occur in patients with preexisting anti-HLA donor-specific antibodies (DSA) or in patients who develop de novo DSA. However, how these processes compare in terms of allograft injury and outcome has not been addressed. From a cohort of 771 kidney biopsy specimens from two North American and five European centers, we performed a systematic assessment of clinical and biologic parameters, histopathology, circulating DSA, and allograft gene expression for all patients with ABMR (n=205). Overall, 103 (50%) patients had preexisting DSA and 102 (50%) had de novo DSA. Compared with patients with preexisting DSA ABMR, patients with de novo DSA ABMR displayed increased proteinuria, more transplant glomerulopathy lesions, and lower glomerulitis, but similar levels of peritubular capillaritis and C4d deposition. De novo DSA ABMR was characterized by increased expression of IFNγ-inducible, natural killer cell, and T cell transcripts, but less expression of AKI transcripts compared with preexisting DSA ABMR. The preexisting DSA ABMR had superior graft survival compared with the de novo DSA ABMR (63% versus 34% at 8 years after rejection, respectively; P<0.001). After adjusting for clinical, histologic, and immunologic characteristics and treatment, we identified de novo DSA ABMR (hazard ratio [HR], 1.82 compared with preexisting DSA ABMR; 95% confidence interval [95% CI], 1.07 to 3.08; P=0.03); low eGFR (<30 ml/min per 1.73 m2) at diagnosis (HR, 3.27; 95% CI, 1.48 to 7.23; P<0.001); ≥0.30 g/g urine protein-to-creatinine ratio (HR, 2.44; 95% CI, 1.47 to 4.09; P<0.001); and presence of cg lesions (HR, 2.25; 95% CI, 1.34 to 3.79; P=0.002) as the main independent determinants of allograft loss. Our findings support the transplant of kidneys into highly sensitized patients and should encourage efforts to monitor patients for de novo DSA. To date, little is known of the differences between ABMR with preexisting and ABMR with de novo DSA. Such comparisons need patients selected from multiple centers to offset differences in center-specific practices and to represent the full spectrum of ABMR scenarios for epidemiologic and mechanistic comparisons.3,15,16 Preexisting DSA ABMR has been mainly studied in highly specialized centers without a real comparison with the de novo DSA ABMR, in terms of phenotypes and outcomes. 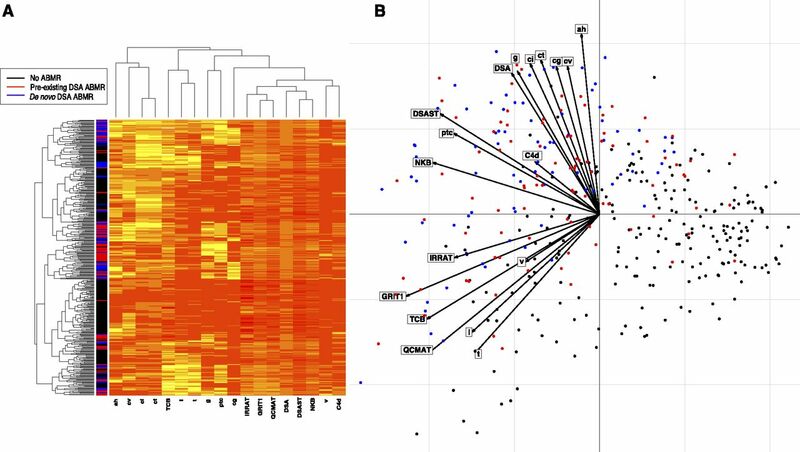 To address this issue, we conducted a study of extensively phenotyped kidney recipients, including conventional and molecular features, the latter from microarray-based gene expression in biopsies.17,18 Our aim was to develop a better understanding of the phenotypes, mechanistic differences, and determinants of prognosis across the entire spectrum of ABMR phenotypes, focusing on the comparison of ABMR with preexisting versus de novo DSA. The result is a multicenter observational study intended to define the determinants of outcome within the entire ABMR population, and to highlight potential leverage points for improving clinical outcomes. From a cohort of 771 kidney biopsies from two North American and five European centers, we selected all patients (one biopsy per patient) with ABMR that were suitable for classification: 103 (50.2%) with preexisting/persisting DSA and 102 (49.8%) with de novo DSA. The DSA were screened at the time of transplantation and at the time of ABMR by single antigen beads. The preexisting DSA were the same at the time of transplant and at the time of the biopsy. Patients without DSA at the time of the biopsy were excluded. The baseline and immunologic characteristics are presented in Table 1. The mean recipient age was similar between the two groups, but the preexisting DSA ABMR group had more DDs (n=93, 90.3%) compared with the de novo DSA ABMR group (n=65, 64.4%; P<0.001). The mean donor age in the preexisting DSA ABMR group was older (48±15 years versus 43±19 years) than that in the de novo DSA ABMR group (P=0.04). The median time of diagnosis of ABMR was 388 days (interquartile range [IQR], 76–1550 days). According to the DSA status, the median time of diagnosis of ABMR in the preexisting DSA ABMR group was much earlier: 85 days (IQR, 17–369 days) versus 1437 days (IQR, 437–3127 days) in the de novo DSA ABMR group (Figure 1A). The median follow-up time after biopsy-proven ABMR was longer: 4.90 years (IQR, 2.87–6.46 years) for the preexisting DSA ABMR group and 3.49 years (IQR, 1.48–5.54 years) for the de novo DSA ABMR group (P=0.001). Early occurence of preexisting anti-HLA DSA ABMR and superior graft survival compared with de novo anti-HLA DSA ABMR. (A) Cumulative incidence of onset ABMR according to the DSA characteristics (preexisting DSA versus de novo DSA). (B) Probability of graft survival on the basis of DSA characteristics. (C) Probability of graft survival according to the DSA characteristics and the presence or absence of cg lesions. cg+ve, cg-positive; cg-ve, cg-negative. There was no difference in renal function between groups at the time of ABMR diagnosis but de novo DSA ABMR presented with more proteinuria (1.51±2.51 g/g creatinine versus 0.51±1.05 g/g creatinine; P<0.001). More preexisting anti-HLA DSA ABMR were subclinical (n=23, 22.3%) compared with de novo anti-HLA DSA ABMR (n=9, 8.8%) but there was no difference in terms of eGFR at the time of the biopsy (eGFR, 39.00±18.26 ml/min per 1.73 m2 in the preexisting anti-HLA DSA group versus 41.65±21.19 ml/min per 1.73 m2 in the de novo anti-HLA DSA group; P=0.34). At the time of transplantation, patients with preexisting DSA ABMR received more thymoglobulin (n=70, 68.0%), plasmapheresis (n=18, 17.5%), anti-CD20 therapy (n=20, 19.4%), and intravenous Ig (IVIG) (n=61, 59.2%) compared with patients with de novo DSA ABMR (P<0.001 for all comparisons) (Table 1). At the time of ABMR biopsy, patients with preexisting DSA ABMR received more steroids (n=81, 78.6%) and more plasmapheresis (n=63, 61.2%) compared with patients with de novo DSA ABMR (n=39, 38.2% and n=28, 26.9%, respectively; P<0.001 for both). There was no difference in the use of anti-CD20 therapy or IVIG (P=0.18 and P=0.42, respectively) (Supplemental Table 1). At the time of transplantation, the median DSA mean fluorescence intensity max in preexisting DSA ABMR was 4500 (IQR, 1862–10,210). The immunodominant DSA was class 1 for 49 patients (47.6%) and class 2 for 54 patients (52.4%). At the time of ABMR, the immunodominant DSA in preexisting DSA ABMR was class 1 for 40 patients (38.8%) and class 2 for 63 patients (61.2%), with a median mean fluorescence intensity (MFI) of 2561 (IQR, 1252–6937). In de novo DSA ABMR, the immunodominant DSA was class 1 for 26 patients (25.5%) and class 2 for 76 patients (74.5%), with a higher median MFI of 7295 (IQR, 1948–11,814; P<0.001). Table 2 depicts the kidney histology at the time of diagnosis. ABMR in preexisting DSA ABMR presented with more glomerulitis (g score: 1.71±1.02 versus 1.06±0.91; P<0.001) compared with de novo DSA ABMR. ABMR in de novo DSA ABMR presented with more double contours (cg score: 1.28±1.15, n=64 of 102 versus 0.48±0.94, n=26 of 103; P<0.001), more tubulitis (t score: 1.01±1.11 versus 0.59±0.90; P=0.003), more atrophy fibrosis (ci score: 1.60±0.92 versus 0.96±1.04; P<0.001; ct score: 1.60±0.91 versus 0.99±0.99; P<0.001) and more arteriolar hyalinosis (ah score: 1.53±1.05 versus 0.97±0.92; P<0.001). There were no significant differences in peritubular capillary inflammation (ptc score: 1.76±0.98 in preexisting DSA ABMR versus 1.66±1.00 in de novo DSA ABMR; P=0.47), C4d deposition in the peritubular capillaries (51% positive C4d deposition in preexisting DSA ABMR versus 42% in de novo DSA ABMR; P=0.13), endarteritis (v score: 0.32±0.65 in preexisting DSA ABMR versus 0.22±0.60 in de novo DSA ABMR; P=0.29), or fibrous intimal thickening and arteriosclerosis (cv score: 1.26±1.00 in preexisting DSA ABMR versus 1.44±0.98 in de novo DSA ABMR; P=0.2). We first compared the global transcript changes in ABMR with preexisting anti-HLA DSA ABMR or de novo anti-HLA DSA ABMR versus all other biopsies in the control set (i.e., without ABMR), plotting fold change and ABMR association strength (P value). 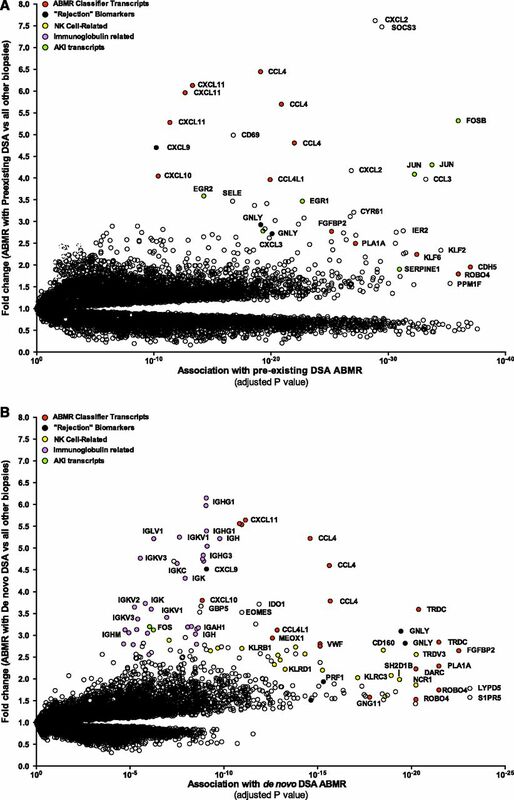 Figure 2A shows the top transcripts associated with preexisting anti-HLA DSA ABMR. The transcripts mostly associated with preexisting anti-HLA ABMR were: (1) natural killer cell–selective transcripts CCL4, KLRD1, SH2D1B, CD160, and NCR1; (2) endothelial and IFNγ-inducible genes including chemokines CXCL11 and CXCL10; and (3) AKI transcripts FOSB, JUN, SERPINE1, and EGR1. AKI transcripts were increased in early biopsies. Preexisting DSA ABMR and de novo DSA ABMR landscapes. (A) Expression of preexisting DSA ABMR transcripts in kidney allografts. (B) Expression of de novo DSA ABMR transcripts in kidney allografts. Dots represent individual probe sets on the microarray. The association strength (x-axis) is compared with fold change (y-axis) defined by ABMR versus all other biopsies of the control set (i.e., without ABMR). NK, natural killer cell. The transcripts mostly associated with de novo anti-HLA DSA ABMR were (Figure 2B): (1) natural killer cell–selective transcripts CD160, TRPV3, KLRC3, and KLRD1; (2) IFNγ-inducible genes including chemokines CXCL11 and CXCL10, and GPB5; and (3) Ig transcripts IGHG1, IGKV1, IGHG3, and IGK. Ig transcripts were a feature of late biopsies. We then compared the expression of pathogenesis-based transcripts (PBTs) in the two groups of patients (Figure 3). The molecular findings were similar in preexisting versus de novo DSA ABMR e.g., DSA-selective transcripts (0.51±0.30 versus 0.54±0.32; P=0.42) and macrophage transcripts (0.56±0.43 versus 0.60±0.37; P=0.1) with slightly lower IFNγ-induced transcripts (0.84±0.42 versus 0.98±0.36; P=0.02). Patients with preexisting DSA ABMR had increased AKI transcripts (injury-repair response-associated transcripts; P<0.01), as expected because these are higher in early transplants. Natural killer cell transcripts (0.71±0.50 versus 0.89±0.46; P=0.01) and effector T cell transcripts (1.18±0.74 versus 1.67±0.82; P<0.001) were lower in preexisting DSA ABMR. Molecular biopsy scores according to DSA characteristics. Data are on the basis of 666 kidney allograft biopsies assessed for intragraft gene expression of the PBTs ([A] endothelial DSA-selective transcripts, [B] macrophage-inducible transcripts, [C] natural killer cell [NK] transcripts, [D] IFNγ production and inducing transcripts, [E] T cell transcripts, [F] injury–repair response transcripts) according to circulating anti-HLA DSA and ABMR status (reference set without ABMR, preexisting DSA ABMR, and de novo DSA ABMR). The T bars indicate SEM and DSA denotes anti-HLA DSA. We compared the top 30 preexisting DSA-related ABMR transcripts with their corresponding fold change and P value (t test) and the fold change and P value in the de novo DSA ABMR. The two ABMR phenotypes were similar e.g., high expression of the IFNγ-inducible genes (CXCL10 and CXCL11) and natural killer cell transcript CCL4 (Supplemental Table 2). Using integrated unsupervised analysis (Figure 4), we confirmed that patients with de novo DSA ABMR had a distinct but close histologic and PBT phenotypes as compared with patients with preexisting DSA ABMR. Integrated immunohistomolecular phenotype of kidney allograft injury on the basis of 666 kidney allografts. Variables considered in this analysis are (1) histologic (glomerulitis, capillaritis, endarteritis, transplant glomerulopathy, interstitial inflammation, tubulitis, and percentage of C4d complement fraction deposition in peritubular capillaries); (2) molecular with intragraft expression of the PBTs (DSA transcripts, natural killer cell transcript burden [NK transcripts], macrophage-inducible transcripts, IFNγ production and inducing transcripts [IFNγ transcripts], T cell transcripts, and injury-repair response-associated transcripts); and (3) immunologic (circulating anti-HLA DSA). (A) Individual overview of histologic and gene expression profiles according to unsupervised cluster analysis. Each variable in an individual patient is colored according to the threshold for each parameter (0–3 with higher score including more severe injuries, transcripts expression level, or DSA). (B) Unsupervised principal component analysis segregating three distinct patterns (individuals factor map) with the variables factor map showing the contribution of each parameter in segregating the three patterns. In the overall population including the preexisting DSA ABMR, the de novo DSA ABMR, and the reference set, the median follow-up postbiopsy was 4.03 years (IQR, 2.02–6.02 years), with 48.8% graft survival at 8 years after ABMR diagnosis. For preexisting DSA ABMR and de novo DSA ABMR, the median follow-up post-ABMR diagnosis was 4 years (IQR, 2.03–6.02 years), with 86 kidneys failing. For preexisting DSA ABMR, median follow-up after diagnosis was 4.90 years (IQR, 2.87–6.46 years) versus 3.49 years (IQR, 1.48–5.54 years) for de novo DSA ABMR (P<0.001). In survival analysis stratified by the anti-HLA DSA status at time of ABMR, patients with de novo DSA ABMR experienced a higher graft loss rate than patients with preexisting DSA ABMR (log-rank test, P<0.001) (Figure 1B). After diagnosis of preexisting DSA ABMR, death-censored graft survival at 2, 4, and 8 years was 91.1%, 78.2%, and 63.2%, respectively, compared with 69.6%, 53.4%, and 34.5%, respectively, for de novo ABMR. Analysis of the preexisting DSA ABMR and de novo DSA ABMR was influenced by the higher frequency of transplant glomerulopathy (cg) lesions in the de novo DSA ABMR. We compared preexisting DSA ABMR versus de novo DSA ABMR in cg-negative biopsies and cg-positive biopsies (Figure 1C). The best survival was for preexisting DSA with no cg-lesions. Graft survival was worst for late onset de novo DSA ABMR with cg lesions, compared with preexisting DSA ABMR with or without cg lesions and de novo DSA ABMR without cg lesions. Univariate Cox analysis of the conventional features (Table 3) showed that the type of donor, eGFR at the time of ABMR diagnosis, proteinuria at the time of ABMR biopsy, DSA presentation (preexisting versus de novo DSA), atrophy and fibrosis score, transplant glomerulopathy (cg) score, and ABMR treatment with steroids were significantly associated with kidney transplant loss. In the multivariate Cox model, the factors independently associated with increased graft loss were as follows (Table 4): de novo DSA ABMR (hazard ratio [HR], 1.82; 95% confidence interval [95% CI], 1.07 to 3.08; P=0.03), eGFR at the time of ABMR diagnosis (eGFR<30 ml/min per 1.73 m2: HR, 3.27; 95% CI, 1.48 to 7.23; P<0.001), proteinuria at the time of the ABMR biopsy (HR, 2.44; 95% CI, 1.47 to 4.09; P<0.001), and the presence of transplant glomerulopathy (HR, 2.25; 95% CI, 1.34 to 3.79; P=0.002). Preexisting DSA ABMR and de novo DSA ABMR remained independently associated with graft loss when the model was performed with ABMR diagnosed during the first 6 years after transplantation (Supplemental Table 3). There was no effect of anti-HLA DSA class on allograft survival in preexisting anti-HLA DSA ABMR (P=0.81) and de novo anti-HLA DSA ABMR (P=0.11) (Supplemental Figure 1). When only the ABMR diagnosed between the first and the third year after transplantation were included, preexisting anti-HLA DSA ABMR exhibited more glomerulitis (P=0.01) and less interstitial inflammation (P=0.01), but there was no difference in peritubular capillaritis, C4d deposition, transplant glomerulopathy, or atrophy-fibrosis (Supplemental Figure 2). Graft survival was significantly higher in the preexisting anti-HLA DSA ABMR group compared with the de novo anti-HLA DSA ABMR group among the biopsies performed between 1 and 3 years post-transplant (P=0.03) (Supplemental Figure 3). A bootstrapping procedure with 1000 samples from the original dataset (see Concise Methods) confirmed the internal validity and robustness of the final model (bias-corrected 95% CIs and bias-corrected and accelerated HRs, Table 4). In this study of kidney biopsies from seven centers, we compared preexisting anti-HLA DSA ABMR with de novo anti-HLA DSA ABMR. We studied long-term allograft survival and determinants of prognosis using an integrative approach that combined clinical donor and recipient data, histology, immunologic characteristics, and the microarray-based gene expression in transplant biopsies. Our study examined the two groups of patients using contemporary tools for a precise allograft phenotyping with a systematic gene expression assessment. As expected, we are the first to show that preexisting DSA ABMR was diagnosed much earlier and, after diagnosis, was treated more aggressively. 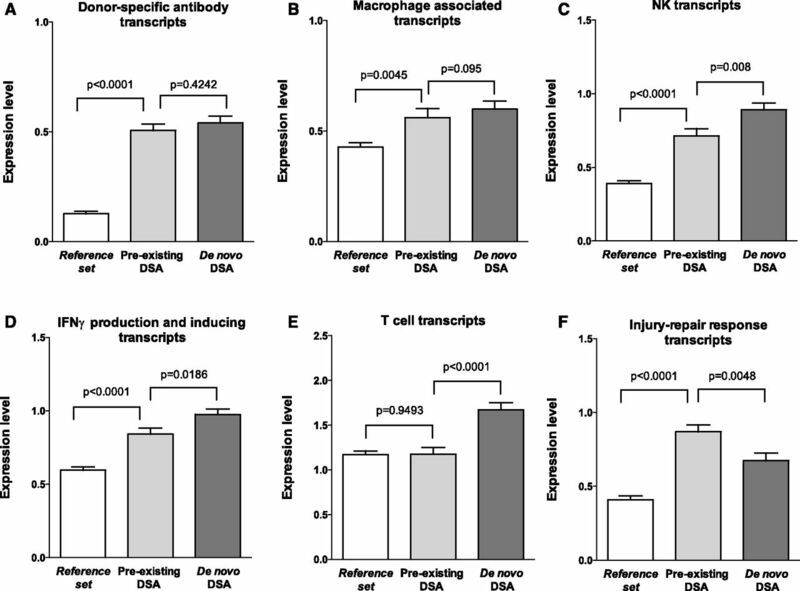 Preexisting DSA ABMR was associated with more molecular injury but less T cell–, natural killer cell–, and IFNγ-associated transcripts. This study highlights some potential leverage points for examination in new trials to improve outcomes, particularly early diagnosis before cg lesions and aggressive treatment at the time of diagnosis. The crucial importance of time of presentation for outcomes after the diagnosis of ABMR raises some interesting potential explanations, which the complex interactions between DSA type and time of biopsy after transplant (TxBx) make difficult to resolve. The fact that preexisting DSA ABMR presents earlier after transplantation (median, 85 days; IQR, 17–369 days) compared with the de novo DSA ABMR (median, 1437 days; IQR, 437–3127 days) may be a key element in its better prognosis, suggesting that the presensitized clones operating before heavy immunosuppression begins are more amenable to suppression. The latter presentation of ABMR in the de novo DSA group is explained by the delayed appearance of de novo DSA in patients on full immunosuppression, and de novo DSA at the time of indication biopsies is rare before 12 months.3,16,19 The DSA at the time of biopsy-proven ABMR was mostly class 2 (n=63, 61.2% and n=76, 74.5%, respectively) but the preexisting DSA ABMR had more class 1 compared with the de novo DSA ABMR. However, the DSA class was not associated with overall graft survival or survival inside the preexisting anti-HLA DSA ABMR group or the de novo anti-HLA DSA ABMR group. Although the patients with preexisting DSA received a more intensive treatment compared with patients with de novo DSA ABMR, this alone probably does not account for the entire difference in survival, which we believe reflects the tendency of preexisting DSA to disappear in some patients with preexisting DSA undergoing continued immunosuppression.20–22 Preexisting DSA ABMR (particularly the cg-negative preexisting DSA group) had better survival than other groups and subgroups, independently of the GFR, proteinuria, and the histologic lesions of ABMR. Preexisting DSA ABMR had an 8-year allograft survival rate of 63.2% (versus 34.5% for de novo DSA ABMR). This observational study design has some limitations. The tight association between time of presentation and type of DSA makes distinguishing the relative importance of time of onset versus type of DSA impossible, and we acknowledge the difficulties of comparing such different scenarios, which include therapy monitoring, probability of nonadherence, and other factors that differ between the preexisting DSA ABMR and the de novo DSA ABMR groups. Our study was performed in seven centers, which makes it vulnerable to center-specific influences. Preexisting DSA ABMR was mostly diagnosed in highly specialized Paris centers, which are used to performing transplantation in DSA-positive patients. On the contrary, in centers where transplants with preexisting DSA are avoided, only de novo DSA ABMR is diagnosed. One interesting possibility raised by the remarkably good survival rate with cg-negative preexisting DSA versus other subgroups, is that preexisting DSA can diminish or disappear with heavy immunosuppression, but de novo DSA emerging on immunosuppression does not. This raises an important question: if de novo DSA emerged very early, would it behave like preexisting DSA or late de novo DSA? Analysis of this question must take into account the diversity of scenarios in a transplant population over TxBx e.g., the contribution of nonadherence and minimization. The TxBx could not be added in the Cox model because of its collinearity with the ABMR phenotype; all of the patients with preexisting DSA ABMR were diagnosed only during the first 6 years after transplantation. However, when the multivariate Cox model was replicated only with the biopsy-proven ABMR during the first 6 years, or when we analyzed only the ABMR without transplant glomerulopathy, the de novo DSA ABMR remained still associated with a worse graft survival. When we compared the graft survival in biopsies performed between the first and third year after transplantation, graft survival was significantly higher in the preexisting anti-HLA DSA ABMR group compared with the de novo anti-HLA ABMR group, even if the biopsies were performed at the same time and if there was no difference for histologic chronic lesions. The patients with cg-negative ABMR correspond to the first stage of ABMR and the disease progresses to cg lesions after many months.25 The fact that cg-negative ABMR in the de novo DSA ABMR is associated with worse graft survival versus cg-negative ABMR because of preexisting DSA supports the conclusion that preexisting DSA ABMR and de novo DSA ABMR are truly different, despite the fact that both can progress to cg-positive ABMR. We postulate that the difference is largely immunologic: preexisting DSA before transplant sometimes disappears but late onset de novo DSA on immunosuppression does not. This is testable in future trials, and raises the possibility that early detection of de novo DSA may allow interventions that increase the possibility that it can be suppressed by more aggressive surveillance/detection and earlier intervention. In conclusion, we compared the two ABMR phenotypes and evaluated the determinants of the outcome in an extensively phenotyped cohort of kidney recipients, incorporating the full spectrum of donor and recipient parameters, and histologic, immunologic, and molecular parameters. Preexisting DSA ABMR occurred earlier after transplantation compared with de novo DSA ABMR and was associated with more molecular injury. ABMR with preexisting DSA was associated with an acceptable and better allograft survival compared with ABMR with de novo DSA, supporting the transplantation of highly sensitized patients and the early detection of ABMR. Among 771 biopsies collected from five European centers (Necker Hospital and Saint-Louis in France, Barcelona in Spain, Hannover in Germany, and Manchester in England) and two North American centers (Edmonton, Canada and Minnesota, United States), we identified 205 patients with a diagnosis of biopsy-proven ABMR in which 103 (50.2%) had preexisting DSA and 102 (49.8%) had de novo DSA. Thirty-seven patients were excluded because of the lack of DSA information or because they had no DSA at the time of ABMR. Only the first biopsy-proven ABMR per patient was analyzed. All of the transplants were compatible on the basis of ABO blood group. The study was approved by local institutional review boards and patients gave informed consent to participate. The allograft injury phenotype in patients with ABMR was assessed by histopathology, immunohistochemical tests, and gene allograft expression. Kidney transplant biopsies with ABMR were compared with all kidney transplant biopsies without ABMR (reference set). The reference set was composed by kidney transplant biopsies without ABMR who underwent biopsies for clinical indication as standard of care, with annotated and validated histopathologic and gene allograft expression provided from ATAGC Reference Standard (http://atagc.med.ualberta.ca/). The baseline characteristics of the reference set patients (n=461) are detailed in Supplemental Table 4. Presence of circulating anti–HLA-A, -B, -Cw, -DR, -DQ, and -DP DSA was analyzed using single-antigen flow bead assays (One Lambda, Inc., Canoga Park, CA) on a Luminex platform on serum samples collected at the time of transplantation and at the time of biopsy. For each patient, we recorded the number, class, specificities, and MFI of all anti-HLA DSA. The maximum MFI for the DSA was defined as the highest ranked donor-specific bead. HLA typing of donors and recipients was performed using DNA typing. Donor HLA typing for HLA-Cw and HLA-DP was only performed if the recipients had circulating anti–HLA-Cw and/or anti–HLA-DP antibodies. The biopsies were graded from 0 to 3 according to the Banff histologic parameters: glomerulitis, tubulitis, interstitial inflammation, endarteritis, peritubular capillary inflammation, transplant glomerulopathy, interstitial fibrosis, tubular atrophy, arterial fibrous intimal thickening, and arteriolar hyaline thickening.26–28 C4d staining was performed by immunohistochemistry on paraffin sections using the human C4d polyclonal antibody. C4d staining was graded from 0 to 3 by the percentage of peritubular capillaries with linear staining. All biopsies were processed for microarray analysis as described previously.29 One 18-gauge biopsy core was placed immediately in RNAlater and stored at −20°C, except for Paris where one 16-gauge biopsy core was obtained at the time of the biopsy and stored at −80°C in OCT for gene expression analysis. RNA extraction, labeling, and hybridization to the HG_U133_Plus_2.0 GeneChip (Affymetrix, Santa Clara, CA) were performed according to the manufacturer’s protocols (www.affymetrix.com). The microarrays were scanned using the Gene Array Scanner (Affymetrix) and processed with GeneChip Operating Software Version 1.4.0 (Affymetrix) and robust multiarray averaging was used to normalize the microarrays. The microarray data files for 205 biopsies were processed using Robust Multiarray Analysis in Bioconductor.30 The molecular characteristics of the biopsies used PBTs that reflect biologic processes of known relevance for the pathogenesis of renal inflammation and injury in transplants. Here, we applied the following PBTs: the AKI-repair-associated transcripts (IRRAT),31 DSA-selective transcripts (DSAST),19,32 IFNγ production and inducing transcripts (GRIT1) (e.g., CXCL11), T cell transcript burden (TCB),33 and quantitative constitutive macrophage-associated transcripts (QCMAT). The information on the probe sets and the algorithms for PBT generation are available on our homepage (http://www.atagc.med.ualberta.ca/Research/GeneLists/Pages/default.aspx). Continuous variables are described using means and SDs or medians and IQRs. We compared means and proportions between groups using Mann–Whitney or the Fisher exact test. To find the genes with the highest differential expression according to preexisting DSA ABMR versus de novo DSA ABMR, we compared the means using t tests with P values corrected for multiple comparisons using the false discovery rate. We performed unsupervised methods to visualize differences according to the ABMR phenotype, including hierarchical clustering and principal component analysis on the basis of a combination of immunology, PBTs, and allograft histology. The kidney survival analysis was performed from the time of transplantation until a maximum follow-up of 8 years with kidney graft loss as the event of interest, defined as the patient’s return to dialysis. For the 11 (5.37%) patients who died with a functioning graft, graft survival was censored at the time of death.34 Kidney allograft survival according to the ABMR phenotype (preexisting DSA versus de novo DSA) status was plotted using Kaplan–Meier curves and compared using the log-rank test. Cox proportional hazards models were applied to quantify the HRs and the 95% CIs for kidney graft loss. The associations of donor, recipient, and transplant parameters and immunologic factors with graft loss were first assessed in univariate regression analyses. All variables with P value of ≤0.10 were then included in one multivariate Cox model. The proportionality assumption for the Cox model was verified using the log graphic method. The internal validity of the final model was confirmed using a bootstrap procedure, which involved generating 1000 datasets derived from resampling the original dataset, and permitted the estimation of the biased corrected 95% CI and the accelerated bootstrap HR.35 We used STATA (version 14, Data Analysis and Statistical Software) and R (version 3.2.1; R Foundation for Statistical Computing) for the descriptive and survival analyses. All of the statistical tests were two-sided, and probability values <0.05 were considered significant. P.F. Halloran holds shares in Transcriptome Sciences Inc., a company with an interest in molecular diagnostics. O.A. and A.L. contributed equally to this work. This article contains supplemental material online at http://jasn.asnjournals.org/lookup/suppl/doi:10.1681/ASN.2016070797/-/DCSupplemental.